how high is session-reconstruction on the to-do list? Bill, all that and more is already developed in Xplico, why don't you try it? in your pcap can be a protocol not decoded by Xplico. Can you provide a pcap (produced with airodump-ng) with a single TCP stream (possibly HTTP)? I loaded "Xplico sample pcap captures download" and can see many pics, emails and other traffic what is perfect for the most of cases/needs. The html "session reconstruction" is present in Xplico. 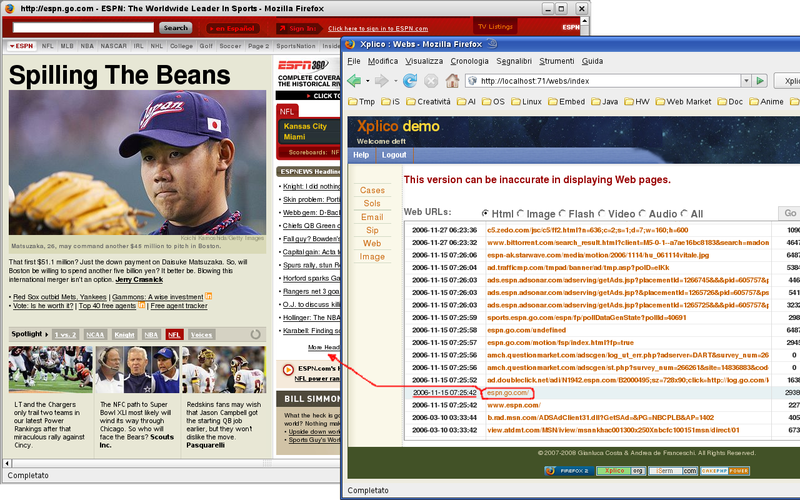 Xplico is able to emulate the browser user cache. To active html "session reconstruction" you must enable, in your browser, the proxy (localhost and 9876 as port). Thank's a lot Gianluca for your help! "For a complete view of html-page set your browser to use Proxy, and point it to Web server"
As I understand, I have to connect to the same webserver as the monitored person in question did before, in order to get a "real view what happend"? No... if I understand correctly your question. it is a must the IP and not the name of the server! Xplico regenerate the page with all the data (as well as saw the person monitored) of course if and only if all data were collected in capture. remove "localhost, 127.0.0.1" from "No Proxy For:"